As you know, my husband is Hindu, and we don't eat beef in our home. I didn't grow up Hindu, but I do choose to respect his faith. I stopped eating beef and pork when I was 17. Since that day there is only one thing I miss. It's really hard to find a good turkey jerky. Most of them are SO tough, you have to dip it in water to get it down (I am reminded of a scene in "Christmas Vacation") yes, that's how dry turkey jerky usually is. Then, I saw this bag in my grocery store that said "Perky Jerky" with a picture of a turkey on the front and decided to try it..desperate to not be failed again. When I opened the bag, I could SMELL how great this was going to be, and reaching inside I felt the soft texture and was so excited, I might finally have my jerky again! Tasting it was just as exciting. It definitely has some spice to it (not enough that Xander and Riley couldn't eat it, in fact, they LOVED it) but enough that I could say it was semi spicy. 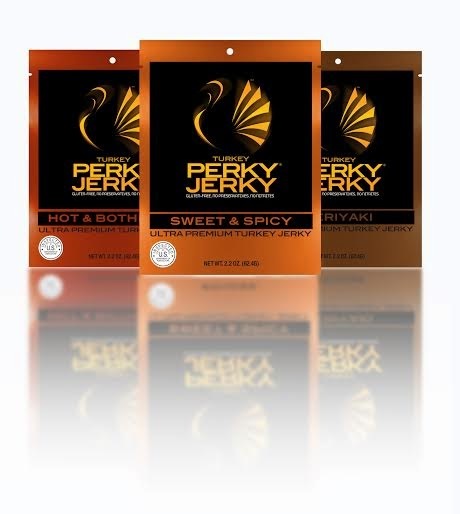 Perky Jerky is an ultra premium, all natural jerky; you no longer need to spend your next road trip eating boring regular beef jerky. 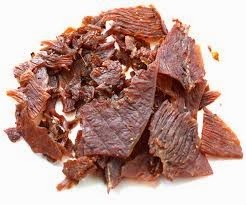 Perky Jerky is a delicious, healthy, low carb snack that helps you step up your game! 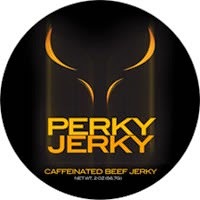 Perky Jerky has an added natural energy source (guarana) added, hence the "perky"...and is also available in beef. If it's anything like the turkey variety, it's awesome!